Home / Resources / Count Us In! 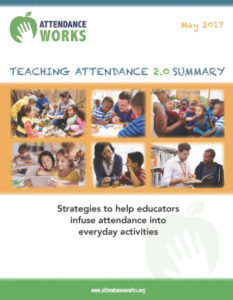 Toolkit 2019 / How Can Educators Improve Attendance? Teachers and early education providers play a key role in reducing chronic absence by teaching children – and reinforcing to parents – the value of attendance. Teachers witness how absences can disrupt learning, not just for the absent student but also for the entire classroom. They can emphasize attendance from Day One, use parent teacher conferences to talk about attendance and promote a culture of attendance. Preschool, Head Start and kindergarten teachers can incorporate attendance into kindergarten transition activities. Principals set the tone for the entire school, ensuring that students, parents and teachers know that attendance matters. That message can be conveyed by greeting families every morning, sending letters homes and having teachers call or record personalized robocalls. Principals can call for the district to provide the data needed to identify at- risk students in need of support. They can also help identify and address systemic barriers and provide professional development to teachers. Superintendents play a pivotal role in monitoring and improving school attendance. Local superintendents can proclaim their support and help launch their local attendance awareness efforts by signing on to the Call to Action on Attendance sponsored by the Campaign for Grade-Level Reading and Attendance Works. Participation signals a commitment to owning the issue, mobilizing the community and driving with data. School Boards can make reducing chronic absence a key policy objective and hold superintendents accountable for taking action to improve attendance. They can commission chronic absence reports and use the results to determine allocation of resources to address problem areas. They can also use chronic absence as a metric for school or superintendent success. Chief state school officers can also help advance awareness and action to improve student attendance. They can use their position as a bully pulpit, promote participation in the Attendance Awareness Campaign, produce and release statewide reports, and encourage local superintendents to sign on to the Call to Action. Success Mentors initiative In New York City, the lessons from then-Mayor Michael Bloomberg’s successful Success Mentor attendance pilot have been widely shared with an emphasis on data tracking, attendance committees and Success Mentors. A community schools initiative championed by Mayor Bill de Blasio now uses these strategies in 45 schools. In 2016, the US Department of Education and the White House launched an initiative to expand Success Mentors to 30 school districts and reach over a quarter million students. As a continuation of the federal initiative, the Department of Education established the National Student Attendance, Engagement, and Success Center (NSAESC). Read more about the National Student Attendance, Engagement, and Success Center (NSAESC). Find strategies, technical assistance, resources and materials on the NSAESC website here. In California the Contra Costa County Office of Education and Attendance Works convened the Contra Costa Attendance Learning Network to promote district collaboration and drive change. Seven of the learning network’s eight districts have seen chronic absence reductions, ranging from 0.5 percent to as high as 12 percent. The county office of education also conducts a year-long attendance awareness campaign “Every School Day Counts” that provides resources, key messages, tools and strategies to all of its 18 districts.